Let your mother, aunt, grandma, sister whoever, know that you truly care and give them the best gift of all…the gift of health!! Rinsing out the nasal cavity is a key step in preventing sinus infections, viruses, or spring allergies from getting you sick. Show the ones you love that you care by getting them a Betti neti Pot! Everyone here at Betti Pot would like to wish the world a happy Earth Day! Get outside and celebrate mother nature! Plant a tree, grow some flowers, run in a field whatever you want. 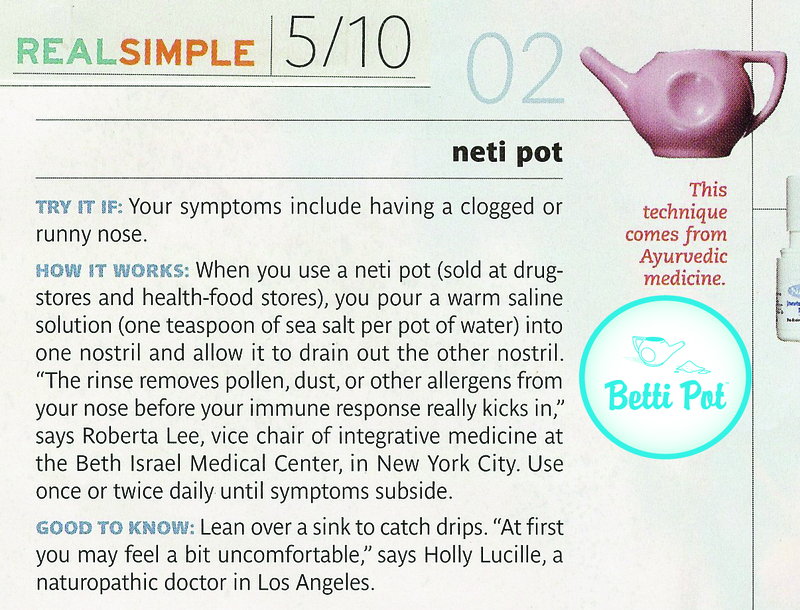 Have no fear of the allergens in the air, thats why you have a Betti neti Pot! For those of us who suffer from the dusting of the pollen fairies green carpet covering cars,decks,in our hair and nose-take heart! Washing the pollen off regularly is the BEST way to fight allergic reactions makes sense .it’s just the process of rinsing the nose that sounds strange. Jala “neti” means “clean your nose daily” and is actually an ancient method of staying healthy. The sinus is open from side to side of the nasal area and it’s easy and actually refreshing to rinse with warm salt water. You understand that the pollen around us ends up in the nose and trapped by the sinus lining. This pollen accumulates there -no wonder we get stuffy and feel bad. I believe this is the tooth brush for the sinus and we are not doing a good job of taking care of our sinus health. Meds have side effects to include blood sugar impairment,blood pressure elevation,mood swings,endocrine disfunction..and the list goes on and on. Not to mention you feel either drowsy or hyper. This will affect your metabolism-a system that needs to be healthy to keep you slim! All of this is common sense and as easy as brushing your teeth,washing your face and getting a good night’s sleep. Take care and lets feel better this spring! Ok gang-everyone is starting up the seasonal chorus”My allergies are terrible already!”. Yes, the flora is proliferating and procreating and pollen is the result. The price we all pay for the beautiful blooms and bountiful green stuff heralding spring. Think about this: how does pollen get into our body to start all those “ahhhchoos” and the watery itchy eyes? YOUR nose!! So would rinsing the sinus regularly help, ya think? Yes.Yes. Yes. And, rinsing regularly with a sea salt solution helps to reduce allergic reactions long term. I always think about common sense solutions for problem like, for example, a hang nail.Lets say you have a hangnail and never wash it. Would that eventually cause a problem requiring medical treatment? Yes.Possibly antibiotic treatment, something that should be used sparingly. But we understand washing that hangnail will significantly reduce the chance of infection, thus avoiding expensive, unnecessary medical intervention. Ok rinsing the sinus of bacteria,pollen,(even fungus-yuck!) is the same process-we call this a proactive health practice! Using simple common sense practices to deal with common health problems.